Regular Guitarist readers will be familiar with UK based Martyn Booth and his beautifully crafted maple topped masterpieces. The trouble is such craft costs and Booth’s Classic and Signature models leave you with little change from £3,000. 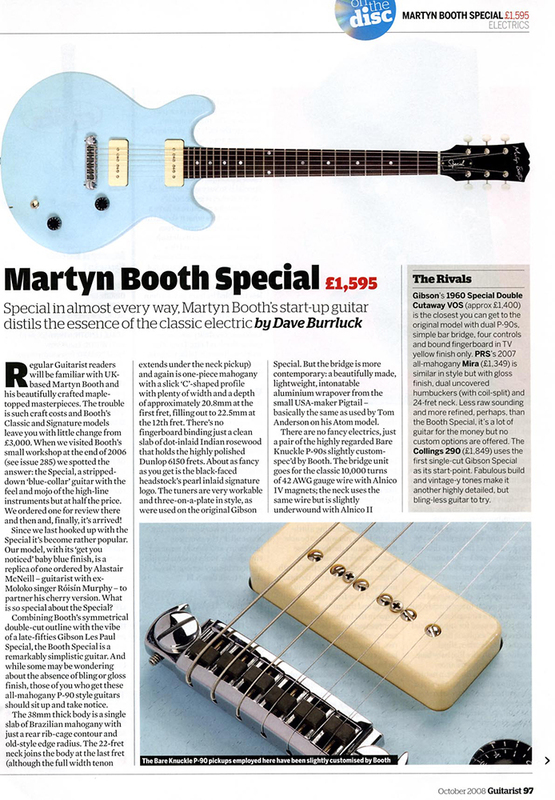 When we visited Booth’s small workshop at the end of 2006 (see issue 285) we spotted the answer: the Special, a stripped down ‘blue-collar’ guitar with the feel and mojo of the high-line instruments but at half the price. We ordered one for review there and then and, finally, it’s arrived! Since we last hooked up with the Special it’s become rather popular. 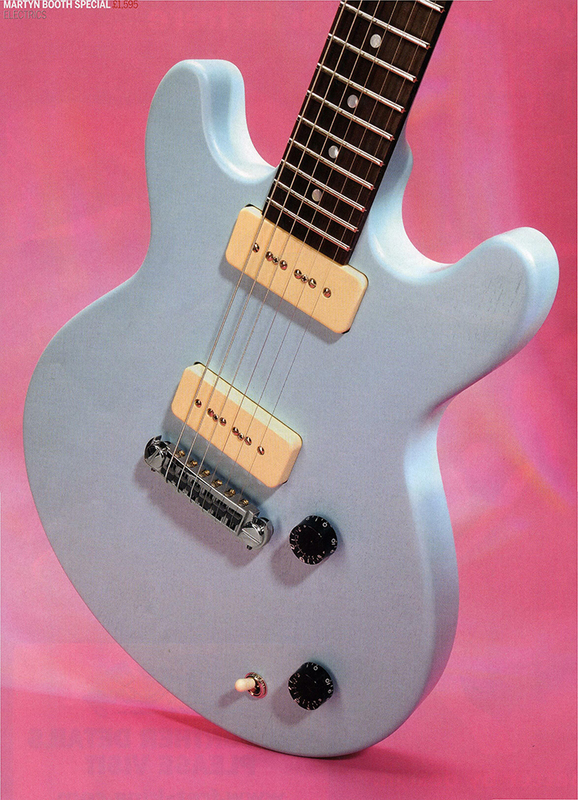 Our model, with its ‘get you noticed’ baby blue finish, is a replica of one ordered by Alastair McNeill – guitarist with ex Moloko singer Roisin Murphy – to partner his cherry version. What is so special about the Special? Combining Booth’s symmetrical double-cut outline with the vibe of a late-fifties Gibson Les Paul Special, the Booth Special is a remarkably simplistic guitar. And while some may be wondering about the absence of bling or gloss finish, those of you who get these all-mahogany P-90 style guitars should sit up and take notice. The 38mm thick body is a single slab of Brazilian mahogany with just a rear rib-cage contour and old-style edge radius. The 22-fret neck joins the body at the last fret (although the full width tenon extends under the neck pickup) and again is one-piece mahogany with a slick ‘C’-shaped profile with plenty of width and a depth of approximately 20.8mm at the first fret, filling out to 22.5mm at the 12th fret. There’s no fingerboard binding just a clean slab of dot-inlaid Indian rosewood that holds the highly polished Dunlop 6150 frets. About as fancy as you get is the black-faced headstock’s pearl inlaid signature logo. The tuners are very workable and three-on-a-plate in style, as were used on the original Gibson Special. But the bridge is more contemporary: a beautifully made, lightweight, intonatable aluminium wrapover from the small USA-maker Pigtail, basically the same as used by Tom Anderson on his Atom model. There are no fancy electrics, just a pair of the highly regarded Bare Knuckle P-90s slightly custom spec’d by Booth. The bridge unit goes for the classic 10,000 turns of 42 AWG gauge wire with Alnico IV magnets; the neck uses the same wire but is slightly under-wound with Alnico II magnets. The three-way toggle and master volume/ tone set-up is simple but the placement of the controls illustrates Booth’s care and thought: the volume is close to the bridge, the tone and toggle a slight right-hand move away. Also the rear control cavity is a work of art – fully shielded and ultra tidy. Just as the seemingly simplistic build is carefully considered, so is the sound. P-90-style single-coils can vary considerably from overly thin and bright to rich and fat. These aren’t the hottest we’ve heard but a little additional preamp gain brings us the required reward: that humbucker like girth with the sizzle, bite and slight percussion of a single-coiI. If you were going to riff out all night with a fairly gained tone you might want something a little hotter, but if you want to be able to play cleaner too then these pickups work in your favour. There’s a bell-like ring that’s both bright and smooth from the bridge pickup, a softer-edged but nicely textured tone from the neck pickup and the mix is Fenderesque in the top end, and more compressed in the lows. There’s near perfect balance between the two. It might seem a simple set-up, but it’s pre-tweaked by Booth to an impeccable standard. The smoothly graduated volume control is another example of excellence. It cleans up nicely, retaining clarity, so with the right amp setting you can select the pickup mix and turn the volume down quite low for your cleaner rhythm fills before switching to neck or bridge and pulling up the volume for your solos. That’s nothing new, of course, but you’d be surprised how many guitars of this style suffer from poor pots. Not here. The tone is smooth down to the fully’ off’ position for a ‘woman’ tone, which has a pronounced and useable midrange bark – just add some gain. It’s this care, with the well chosen pickups, that make this Special is so very special indeed. It’s not rocket science but it’s always such a pleasure to have a guitar that does what it should in the sound department. From those clean tones to its default vintage-y Gibson grind this highly resonant Special covers a lot of ground and, although not hum-cancelling in the mixed position, these single-coils seem less troubled by hum pickup than many we’ve experienced. Add in the excellent strapped-on feel, easy fingerboard access and fluid, faultless playability and here’s a guitar that has Long Term Test written all over it. In fact, it’s the sort of guitar we’d be happy to test for many, many years. It sometimes beggars belief that guitar makers – large and small fail to nail a simplistic design like this. Martyn Booth passes the test with flying colours and creates not just a replica but also a guitar that improves on the original. From the wood choice through to the control placement the instrument is very carefully considered. The custom spec pickups are a perfect match and even retro flourishes like the old style tuners work perfectly. But above all it’s the effortless playability and woody, resonant, vintage-like tones that make this a guitar that any serious player should track down. We dislike: Nothing … although we’d probably go for a more classic colour and a scratchplate! 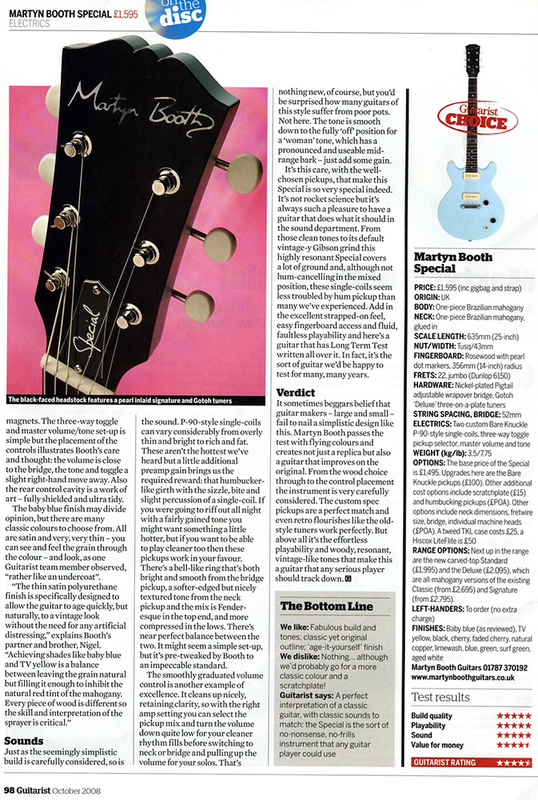 Guitarist says: A perfect interpretation of a classic guitar, with classic sounds to match: the Special is the sort of no-nonsense. no-frills instrument that any guitar player could use.